Kuta Bali, is a mix of Balinese culture and what would be a Australian surfers culture from the 70's. 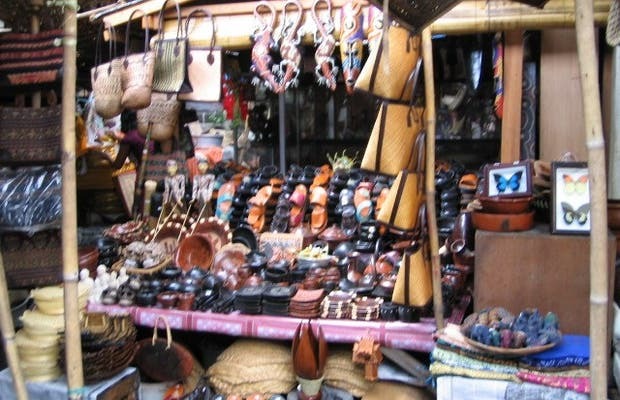 If you go to the market, you will find the same mix of phones and digital cameras for very low prices, small Balinese temples to put a candle in, leather sandals, incense holder or wooden combs. A popular souvenir is the mask of Bali. Sculpted in wood which is usually painted with natural colors in acrylic paints. Wrought iron is also present, with stars, lamps and many dragons and statues of Buddha in different positions of meditation. If you're peckish, several people will offer freshly prepared fruit like pineapple or watermelon, fried rice dishes with egg and cold drinks.